When planting a Hydrangea there are two ways in which this can be done and it depends on if the Hydrangea is all ready in a pot (ie been grown in a pot) or if you plan in moving a Hydrangea that is already planted in the ground. Planting Hydrangeas which have been grown in pots? 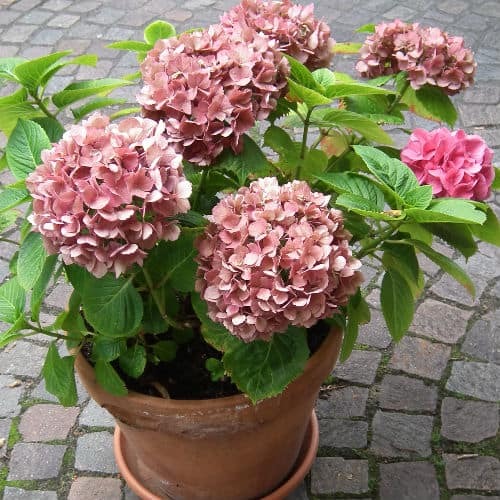 Firstly Hydrangea grown in pots can be planted any time of year, ensure the soil is free-draining and does not flood and the spot is either in partial shade or sun. To much shade and you risk poor or worst no flowers. Ideally, mix some well-rotted farm manure of fertilizer into the soil and mix in well. Firm the soil around the roots to ensure there are no air pockets around the roots and it is firm in the ground. Planting & moving a Hydrangea to a new spot that has already been planted? Hydrangeas that are already planted in the ground may on some occasions need moving. This could be for various reasons such as hydrangea is going to grow too big for current area or Hydrangea has been planted in an area too shady and it fails to thrive. Whatever the reason they steps and notes must be taken into consideration to successfully transplant the hydrangea. Hydrangeas can only be lifted once they have gone dormant, this is when they have dropped all there leaves for the winter. Never lift a Hydrangea that is still in leaf. They usually go dormant from around October but this can vary from country to country. Once dormant start by digging around the plant to form a large root ball as big as possible. The aim is to avoid disturbing the roots as much as possible and to ensure that as much of the root is dug up as possible. Dig a large whole large enough to accommodate the root ball of the hydrangea. As with potted hydrangeas it good practice to mix some well-rotted farm manure or fertilizer in the hole. Firm around the plant and water well, it may require a stake to help keep it upright until it has got some new roots out. Ideally, plant in a spot that gets morning sun and afternoon shade as they seem to do well. Don’t plant in very shady spots as Hydrangea want to flourish, saying these Oakleaf Hydrangeas are known to grow well in shade as well as the sun so there are exceptions. Try to avoid planting pot grown Hydrangea in early spring if possible to avoid frost damage to roots. Finally, all ways make sure the soil has good drainage, a common mistake is planting in clay soil which asks like a sump and collects water and rots the roots of plants. Mixing gravel through the clay and adding some peat can help improve the soil drainage. Tip to know: Mop head Hydrangeas flower on old wood so pruning in spring will cut off most of the flowers. All ways prune if needed as soon as they have finished flowering usually around August.